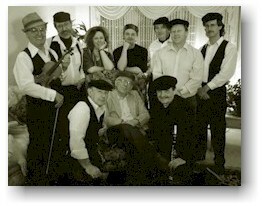 The Saskatoon Klezmer Band, Zmarim, was formed in 1985 after an informal "kibitzing" at a Bar Mitzvah. Several of the players at that event decided to get together on a semi-formal basis, and since then the Band has added members and various instruments. It now includes eleven members: flute and vocals, clarinet, violin, cello and vocals, trombone, guitar and French horn, accordion, bass, percussion, and keyboards. The members come from a variety of backgrounds: there are two lawyers, a dental surgeon, three business men, a couple of teachers, and three PhD's. The repertoire of Zmarim includes both vocal and instrumental music. This includes music from Scripture, humorous Yiddish tunes, traditional Romanian horas and the energetic Israeli type, music from the Middle East, solo instrumental numbers, jazz, traditional klezmer, and Broadway show tunes. Best viewed with 800x600 resolution or greater. You will need the latest version of Real Audio to listen to the sound clips. Please contact the webmaster, if you have any technical problems. © Copyright 2000, 2001 by The Saskatoon Klezmer Band, All Rights Reserved.